What level of care do you want? As the pain starts to ease we start to focus more on your ability. Muscle and other soft tissue damage continues to heal after your original symptoms have improved. Some people judge their health by “lack of pain” but this is a poor guide as healing continues for many weeks after pain has subsided. Ideally, we want to get 1) your joints moving properly, 2) address the underlying postural issues & faulty movement patterns that may have precipitated your injury and 3) reduce any nerve interference. Visit frequency is reduced and you will be encouraged to supplement your care with exercises and other self-care procedures. Strengthening, retraining an improving co-ordination in the whole joint ecosystem are important if you want to keep the keep and build on the benefits you’ve got from the First Phase of care. It also helps to remember that many of the conditions we can help with, have developed over many years, that’s why rehabilitation is a process not an event. People who choose this type of care for themselves and their families are not motivated by pain but by becoming and being more healthy. 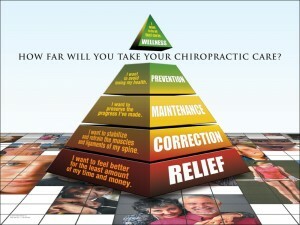 Some of our clients view these visits as maintenance visits and they live by the “prevention is better than cure” model. With regular check-ups they maintain greater flexibility, adaptability and resilience to life’s physical, chemical, mental and emotional stressors. Others acknowledge the long term benefits that an optionally functioning spine and a nervous system free from interference, brings and they schedule 1- 4 visits per month. In fact, on any one day, about 50% of our clients will be coming in for this type of care. We know that this kind of care can become a financial stress for some families, so we have a Wellness Club that makes staying healthy more affordable. Now, have a look at picture at the top of the page. Which type of care do you want for yourself and your loved ones?